I landed this morning in London, the capital of a nation that voted to turn its back on its neighbors. He smiled. “Let’s hope we do. We all want you to stay.” That was the last conversation I had as a European, an identity I’d acquired officially along with a British passport a year ago, but one which felt at least as precious as any piece of paper. My Europe was a continent with a bloody past but a brilliant future, where language and literature and food and wine and film and theater were all enriched by a culture that looked confidently outward, and a political settlement that not only kept the peace for over half a century, but acted as a powerful magnet pulling countries on the periphery toward the European political norms of democracy and civility. I landed this morning in London, capital of a nation that voted to turn its back on its neighbors. We all saw voting Remain as a moral imperative in the face of a fraudulent, racist, xenophobic Leave campaign. Of course, the European reality wasn’t always so pretty. As faithful readers will know, the other half of the London bureau is Greek, and knew better than anyone the torments inflicted on her country by Europe’s political failures and Germany’s blind obsession with austerity. Since I was going to be out of the country, she insisted on making arrangements to cast my proxy, and our daughter’s, for Remain—a vote we all saw as a moral imperative in the face of a fraudulent, racist, xenophobic Leave campaign. And now that campaign has won. 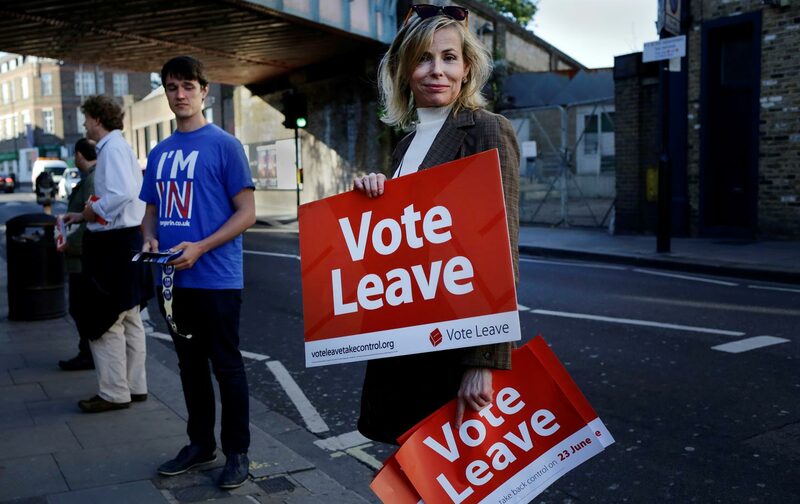 Though Scotland, Northern Ireland, London, Liverpool, Manchester, and Leeds all voted strongly for Britain to remain part of the European Union, the Leave campaign won overall by a margin of 1.2 million votes. From George Orwell’s Wigan to Wordsworth’s Cumbria to Shakespeare’s Stratford-upon-Avon, the English people have decided they do not want to be European any more. There are people who will tell you the reasons for that rejection are complex; two weeks ago, I would have been one of them. For decades, the press here have used Brussels as shorthand for an overweening undemocratic bureaucracy. And there has always been plenty of truth in that depiction, from fruit-and-veg stands penalized for selling their wares in pounds and ounces to a recent European court decision barring Scotland from imposing a minimum price on alcohol as a way of deterring binge drinking. Nor did German Foreign Minister Wolfgang Schäuble, the European Central Bank, or the European Commission cover themselves in glory during the financial crisis. It was also horribly clear that whatever lessons might have been learned watching the burning of Sarajevo and the slaughter in Srebrenica were long forgotten by the time Syria’s refugees came knocking at the gates. But this wasn’t about the economy, stupid. Chancellor George Osborne’s own version of austerity managed to choke off Labour’s moderate recovery—but by now Britain’s economy was indeed growing. Until this morning. And though the Leave campaign’s brilliant slogan “Take Back Control” was designed to suggest otherwise, it wasn’t about sovereignty or democracy, either. If it had been, the Leave-ers would have followed Tony Benn and the old Euroskeptic left in calling for Britain to leave NATO—an entangling alliance that actually requires the country to go to war if any of its members are attacked. The political consequences were immediate. By lunchtime, Prime Minister David Cameron announced his resignation—with a new leader to be chosen at the Tory Party Conference in October. It will be up to that leader to trigger Article 50 of the Lisbon Treaty, starting the two-year clock on the terms of a divorce that will have to be agreed to by all of Europe’s remaining 27 countries. Even before Cameron spoke, Nicola Sturgeon, leader of the Scottish National Party, said that the prospect of her country’s being dragged out of Europe against its will made a second referendum on Scottish independence “highly likely.” The effect in Northern Ireland is less clear—but at the very least, closing Britain’s only land border with Europe could have a disastrous effect on the peace process. It might even provide the unexpected spur for Irish unification. By Friday afternoon Jeremy Corbyn, whose leadership of Labour’s Remain campaign was widely viewed as too little, too late, faced a no-confidence vote among his own MPs. A shrinking economy means less money for schools and the National Health Service. The economic fallout will take longer to accumulate. Though headlines screamed that the pound sterling had hit a 30-year low, it had sunk to a similar level in February and soon recovered. House prices are widely expected to fall—bad news for Britons who had used them as brick-and-mortar pensions, but good news for many others. Likewise the rising cost of imports—and falling price of British-made goods—will produce winners and losers. This morning Britain’s paper economy lost £120 billion, moving Britain behind France to become the world’s sixth-largest economy. If the real British economy shrinks—as the Bank of England warned it would—it won’t be the chattering classes on either side of this debate who suffer. A shrinking economy means less money for schools, and the National Health Service, and less money to spend on infrastructure or addressing the threat of climate change. Nor will those effects be confined to this island nation. You can’t build a wall to keep in capital—or keep out ideas. Brexit has pulled a leg out from under the whole European project. Even if the Dutch and the French governments hold off calls from their own nationalist parties for similar referendums—a siren song that is likely to spread—the world’s largest free market has, overnight, become a less predictable place to do business, a less attractive place to invest, and a less stable location for businesses of all sizes. Far more dangerous, though, is the example the British have set for the world of a post-factual democracy. There are plenty of ways to parse the vote demographically: the young, who voted overwhelmingly for Remain, being cut off from a European future by their parents and grandparents. The regions that have been left behind by Britain’s incredibly uneven prosperity taking revenge by voting the country out. The countryside voting against the cities. But the debate here wasn’t about any of that. The debate was about foreigners taking British jobs, ordinary people being urged (by elite politicians) to defy the establishment, and a constant drumbeat—sometimes at dog-whistle pitch, sometimes a whole lot more shrill—that people who don’t look like us are swamping the country and overwhelming our institutions. To Americans tempted to think we are far too smart to be led astray in similar numbers by our own blond demagogue, I can only say: The British thought it couldn’t happen here, too. And it just did.